Leonidas Platanias, MD, PhD, the Jesse, Sara, Andrew, Abigail, Benjamin and Elizabeth Lurie Professor of Oncology and director of the Robert H. Lurie Comprehensive Cancer Center, was senior author of the study published in the journal Blood. 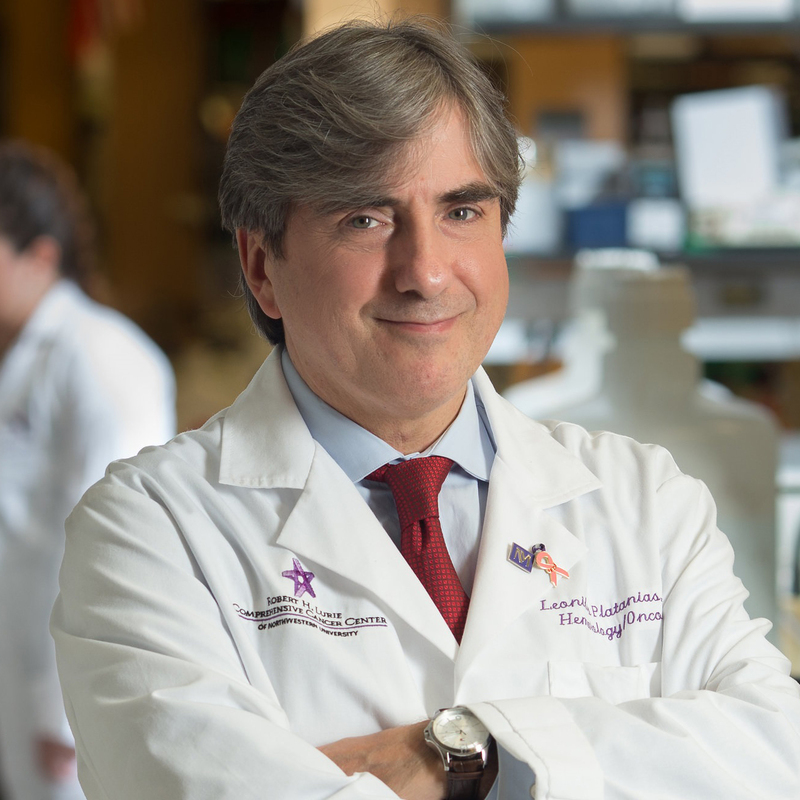 An overactive protein complex that helps drive the development of leukemia may explain why many therapies for the cancer have proven ineffective, according to a new Northwestern Medicine study published in the journal Blood. Another complex, called mTORC, is often upregulated in leukemia but was previously believed to be the only one exhibiting this behavior — until the current study, when Northwestern scientists discovered a never-before-seen counterpart, called cTORC. This newly identified complex has a similar function, and its existence may explain why cancer therapies targeting only mTORC have been unsuccessful thus far, according to Leonidas Platanias, MD, PhD, the Jesse, Sara, Andrew, Abigail, Benjamin and Elizabeth Lurie Professor of Oncology, director of the Robert H. Lurie Comprehensive Cancer Center of Northwestern University and senior author of the study. mTORC is a protein complex comprised of a central kinase, called mammalian target of rapamycin (mTOR). That central kinase is bound to various smaller proteins — an arrangement like a planet with orbiting moons. In normal cells, mTORC regulates protein production, but about 60 percent of patients with acute myeloid leukemia (AML) have mutations that abnormally activate the pathway, speeding protein synthesis and contributing to cancer growth. Because it regulates critical cellular functions, targeting mTOR was regarded as a promising therapy, according to Platanias. However, human trials found only modest success in a small number of tumors, leading scientists to search for other ways to target this protein production pathway. In the current study, Platanias and his colleagues used a proteomic approach to identify other complexes that contained some of the same “orbiting” proteins as mTORC. They discovered cTORC, a similar protein complex with a kinase called CDK9 at the center. Transcriptional analysis confirmed that cTORC also contributed to cancer growth, and inhibiting cTORC in mouse models of AML successfully slowed the cancer, according to the study. There is evidence that targeting CDK9 could work in humans, but Platanias believes a combination therapy would be most effective. Cancers are notoriously complex, Platanias explained, with backup mechanisms or secondary pathways that kick in if something is shut down or broken. The next step is to test the CDK9 inhibitor’s effectiveness in human trials. Further, these findings shift the prevailing view of these protein complexes, Platanias said, encouraging other investigators to re-examine similar complexes that may have been overlooked, with the hopes of identifying things that have disease relevance. Elspeth Beauchamp, PhD, research assistant professor of Medicine in the Division of Hematology and Oncology, was first author of the study. Co-authors include Jessica Altman, MD, and Olga Frankfurt, MD, both associate professors of Medicine in the Division of Hematology and Oncology. All three are members of the Robert H. Lurie Comprehensive Cancer Center. This work was supported in part by National Institutes of Health, National Cancer Institute (NCI) grants CA121192, CA77816 and CA189074, and by grant I01CX000916 from the Department of Veterans Affairs.